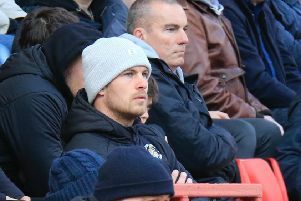 Nathan Jones began his reign as Luton Town manager with a goalless draw against Cambridge United at Kenilworth Road this afternoon. The newly-appointed boss would have been enthused by his side’s second half performance, as they created a number of goalscoring opportunities, denied a last-gasp winner when Jake Howells was denied by Wil Norris. However, Luton were handed a huge let-off with 15 minutes to go when Cambridge scored through Ben Williamson, but the goal wasn’t allowed to stand as referee Andrew Madley had whistled a fraction earlier for a foul by home striker Paul Benson, giving the visitors a free kick. Jones had made two changes from the side who lost 2-0 at Bristol Rovers for his first game in charge, with Danny Green and Jack Marriott in for Craig Mackail-Smith and Cameron McGeehan, the latter not even on the bench despite being the club’s top scorer. The new boss was dealt a huge blow to his preparations after just eight minutes though when out of nothing, keeper Mark Tyler was left on his haunches with what appeared to be a back injury, meaning that Elliot Justham had to make an unexpected start. With Hatters looking like they had been encouraged to play a more possession-style game, particularly out from the bag, they also displayed an inventive corner routine too, Green running from deep to cross first time, although it was cleared away. However, Luton were then dealt another injury blow on 20 minutes when Green went down awkwardly and with the stretcher and various leg braces called for, he was eventually replaced by Josh McQuoid. Hatters thought they had the lead on the half hour when McQuoid picked up Ryan Hall’s fine pass, cut in, and his deflected shot was acrobatically volleyed in by Marriott, only to be met by the offside flag. U’s then came close themselves as they worked a lovely move through the centre, Robbie Simpson shooting narrowly over, before new signing Williamson was off target too. Luton still couldn’t fashion anything at the visitors goal though, with Jonathan Smith’s left footer watched wide by Will Norris. A speculative volley from Luke Berry didn’t test Justham, while Hatters did finally make Norris, as he had to block Benson’s close range attempt from Hall’s corner, Town’s first attempt on target in over two hours of football. After the break, Luton improved immediately, as they started to show, at least going forward, what Jones is trying to implement, switching the ball wide and creating some real pressure. Hall was inches away from breaking the deadlock, stretching to half volley narrowly wide, with the winger then finding McQuoid whose curler didn’t come down in time. Back came the U’s though, with Magnus Okuonghae and Scott Cuthbert both making crucial blocks in their area, although their efforts were bettered by Howells, who superbly deflected Luke Berry’s effort away. Then came the game’s main talking point as Madley blew before Williamson scored, the official throwing his hands to his face in realisation of the error made, before being surrounded by incensed Cambridge players. Hall, who had his best game for the club so far, joined Luton’s growing casualty list, replaced by Paddy McCourt, while Marriott struggled through the final 10 minutes too after picking up a knock. With time running out, Ryan Donaldson forced Justham to save from a free kick, as Luton almost won it, but Howells low effort was parried by Norris. Town’s hearts were then in their mouths as Justham almost spilt a long range shot into the net, but fortunately it fell the wrong side of the post, as Hatters ended a run of three straight home defeats, kicking off Jones’ tenure with a point. Hatters: Mark Tyler (Elliot Justham 8), Stephen O’Donnell, Jake Howells, Magnus Okuonghae, Scott Cuthbert (C), Danny Green (Josh McQuoid 20), Alex Lawless, Jonathan Smith, Ryan Hall (Paddy McCourt 74), Paul Benson, Jack Marriott. Subs not used: Dan Potts, Craig Mackail-Smith, Olly Lee, Luke Wilkinson. United: Will Norris, Mark Roberts (C), Leon Legge, Luke Berry, Barry Corr (Harrison Dunk 65), Lewis Page, Robbie Simpson (Karlan Ahearne-Grant 66), James Dunne, Ben Williamson, Ryan Ledson (Ryan Donaldson 77), Darnell Furlong. Subs not used: Elliot Omozusi, Sam Beasant, Josh Coulson, Conor Newton. Booked: Smith 43, Marriott 54, McQuoid 65, Dunne 69, Benson, Lawless 78.